Fish balls are popular street-food in the Philippines that are sold by street vendors pushing wooden deep frying carts. The balls are fried then served skewered in bamboo sticks, and offered with a choice of dipping sauces. 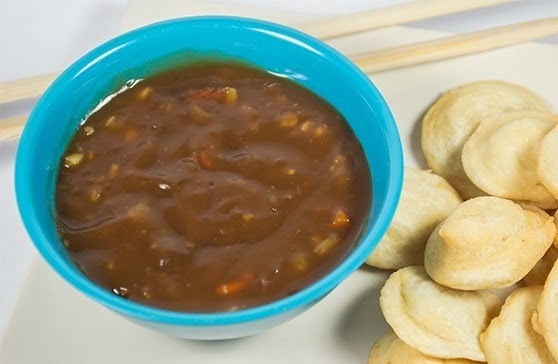 Here's one of the more popular dipping sauce right from Manong's kitchen. 1. In a sauce pan, dissolve cornstarch, flour, and brown sugar in water. 2. Stir in soy sauce. Put the pan on the stove and bring to a boil. 3. Add red onion, garlic, and siling labuyo. Omit the chili and add a little more sugar if you prefer a sweet rather than a spicy dipping sauce. 4. Reduce heat. Stir constantly to prevent scorching. 5. Simmer until sauce thickens. Serve with fried fishballs, kikiam or squidballs.